The aim of the Steeple Aston Church Bellringers is to ring the Church bells on Sundays and for other services such as weddings. They meet in Steeple Aston Church tower for practice every Tuesday at 7.30pm and also on Sundays half an hour before the service. They also ring the bells on special occasions. 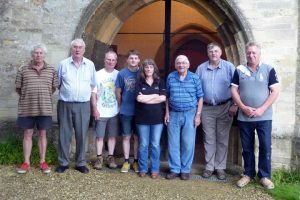 Following their successful ringing of a quarter peal to mark the Queen’s 90th birthday on April 21st 2016, Steeple Aston Bell ringers and friends took on the much more arduous task of ringing a full peal for her official birthday on Sunday, 12th June 2016. The ringers taking part, pictured here, were (l to r): Lawrence White (SA), Malcolm Hensher (SA), Michael Austin (Hook Norton), Daniel Austin (Hook Norton), Sally Austin (Hook Norton), Alan Griffin (Bloxham), Graham Clifton (conductor) (SA), Nicholas Powell (SA). The Bellringers are a very sociable group and welcome visitors. They also have many social events through the year. Anyone over the age of 10 is welcome to join the group. The only proviso is that you must be able to climb the stairs. There is no fee to pay but when you are able to handle a bell you may become a member of the Oxford Diocesan Guild of Church Bell Ringers, for which an annual subscription is £9. If you are interested in joining, either give Graham a call to discuss ringing or just turn up on a practice night and have a try. The main purpose of the Handbell Ringers is to play Christmas carols door-to-door round Steeple and Middle Aston in the two weeks leading up to Christmas. They choose a different charity to collect for every year. They meet to practise on Sunday evenings at 7.30pm in a member’s house. Meetings start in September if they have been asked to entertain for a given function, but in late October if they are just practising carols. The handbells are the property of the parish church and it is traditional that handbell ringers are church bell ringers as well. Anyone over the age of 10 is welcome to join the group. You don’t necessarily have to be able to read music as they play by numbers. Membership is free. If you are interested in joining the Handbell Ringers, contact Sally or Graham. Steeple Aston Players are a group of enthusiasts who enjoy staging plays and musicals in the Village Hall. Their most recent productions have included scripts written by their members. They aim to put on at least one show each year, and they usually perform them on three consecutive evenings. In addition, they meet up for play reading evenings in The Red Lion. If you would like to join them, either on stage or backstage, please contact Alan Wightman. 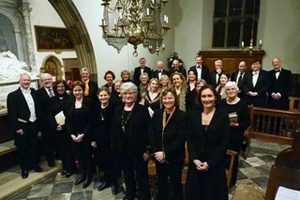 Steeple Aston Choral Society was founded over thirty years ago for local singers of all abilities. It is very fortunate to have Paul Badley, a professional solo and ensemble singer and teacher, as its Director, and Paul Herrington, a teacher, composer/arranger and LCM examination local representative, as its accompanist. It is also honoured to have another local professional musician, Heather Cleobury, as its Honorary Patron. Currently the Society has about forty members who perform three concerts a year in either the Village Hall, or the Church. The autumn and spring concerts are usually standard choral works, while the summer ‘party’ concert also features light music. Concert rehearsals are on Mondays from 7.45-9.45pm in the Village Hall. Anyone who enjoys socialising and music making with others, is welcome. There are no auditions – just come along and join in. For more information on concerts and membership go to www.facebook.com/steepleastonchoralsociety/ or contact one of the officers listed below. Many thanks to all of you who came to our Spring Concert. We knew you would like the Mozart Requiem, but we were especially pleased that you enjoyed the Hummel Mass in Eb and Paul Herrington’s Te Deum, on first hearing. We thoroughly enjoyed singing all of the works and we would like to thank our conductor Paul Badley, and our rehearsal accompanist and composer, Paul Herrington for their help and support throughout. Thanks also to organist, Alex Aitken and soloists, Angela Kazimierczuk, Fran Jellard, Jeff Stewart and Martin Robson for their wonderful contributions to the performance. 6.30 for 7.00pm in the Village Hall. Your ticket includes refreshments (including strawberries and wine) and it will be table seating (tables seat 8) – available from 6.30. So gather your friends and join us. An evening of keyboard music (from Bach to Lloyd Webber) played by Paul Herrington, accompanist and arranger for SACS; volunteer pianist for the National Trust and Oxfordshire representative for London College of Music exams. Your ticket includes refreshments (wine and nibbles) and it will be table seating (tables seat 8) – available from 7.00. An evening of seasonal music for Advent and Christmas.